My husband and I have entirely incompatible methods for making popcorn. For him, the aim is to have as few un-popped kernels as possible. So he's been carefully honing his oil-to-kernel ratio, which he measures in grams. I'll concede that his popcorn occasionally tastes better than mine. Okay, it almost always tastes better. But it's still wrong, because both I and our popcorn popper come from my father's school of popcorn making. When I was growing up, my dad used the stovetop method. His blackened aluminum pot could be brought out for occasions big or small, but was always guaranteed if my siblings and I won our invented game of "Dogpile on Dad." Even though there were four of us and one of him, I suspect he was often just pretending to be pinned because he liked popcorn even more than we did. The joy of stovetop popcorn is in the sounds: the tinny pings of kernels being poured into the pan, the hissing that precedes metallic pops inside the pot, the squeals of four kids jumping with each early pop right through the finish, when the lid rises above the pot, the popping jumps an octave, and stray pieces drop to the floor for two happy dogs to snap up. My dad's popcorn pot is long gone. My grandfather discovered Orville Redenbacher's Power Pop and converted the whole family to the microwave method. But I've carried on the proud tradition of overfilling. I don't consider popcorn a success unless a few pieces wind up on the bottom of the microwave. And my son has begun hopping around the kitchen, adding his own spin on the tradition by counting each pop. So it's perhaps not a surprise that I'm now looking for any excuse to make popcorn. And although I'll never tire of the plain variety, I've been using my son's enthusiasm for popcorn as a way to introduce new flavors. With our new balsamic popcorn salad we're joining Snoopy, Olivia Pope, and the other greats who eat popcorn for dinner. Warm balsamic popcorn. Greens omitted to placate threenager. This is less recipe than strategy for clearing out whatever you've got in the fridge. A sad-looking carrot? A stray sun-dried tomato? A wilted bag of spinach? The last two olives in that giant jar of Costco olives taking up all of your fridge space? That adorable package of cubed pancetta you bought at Trader Joe's because you want to be the kind of person who cooks pancetta but lost in the crisper drawer three months ago? Slice or shred them all and toss them in. You can use my husband's ratio (25 grams oil to 50 grams popcorn), or my dad's method of splashing whatever amount of oil and popcorn look good today. I highly recommend the Power Pop, but any method will do as long as you're avoiding the fake butter flavor, which is 1) gross and 2) will destroy the premise of eating a "healthy" salad for dinner. 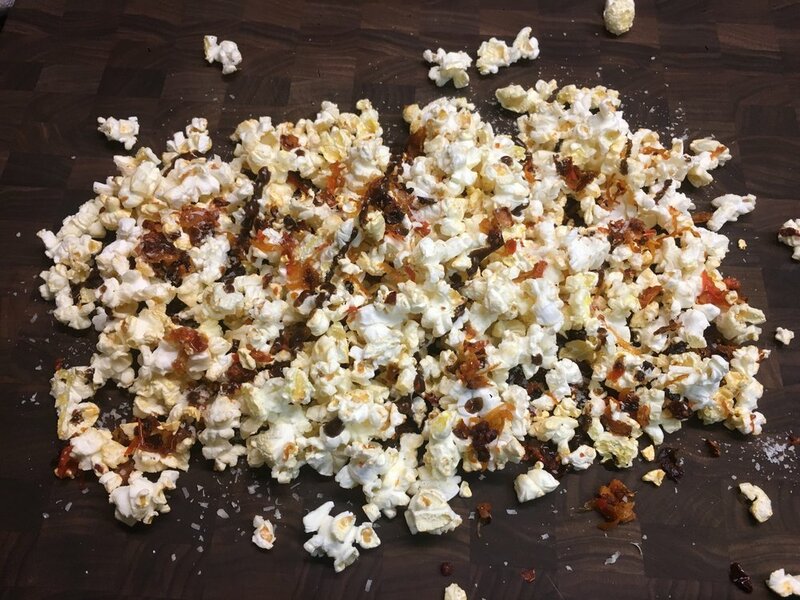 Keep popping until you have 6 cups of popcorn, or more if you want to snack while you're cooking. Make the dressing: In a small bowl, whisk together olive oil, balsamic vinegar, dijon mustard, salt, and pepper. Reserve 2 tbsp. for recipe and store remainder in fridge for future use. Make the popcorn: In a large saucepan or wok, heat olive oil. Add red pepper and shallot and cook until soft. Add arugula and popcorn and toss to combine. Cook for 30 seconds. Transfer to large platter. Top with parmesan cheese, balsamic dressing, basil, and salt. This post contains affiliate links. If you shop through them, you'll keep snackdinner ad-free and keep up our stock of water beads. On second thought, don't click. We still haven't gotten the last batch out of our HVAC system.